People who complain that Bristol's public transport system is bad have missed an obvious fact: all vehicles are buses. Why else would all of these be going through a road-closed area that is blocked off to everything but buses? Why? Well, how else do you get from Kingsdown to Gloucester Road when Cotham Brow is closed. Indeed, two days later, the no-entry signs at this end (and the one-way signs at the other) were taped over. so when there were head-on conflicts such as happens below, both sides would feel they were wronged..
Perhaps then, just as bike lanes follow unofficial cycling routes, these motorists are leading a way in defacto actions which will eventually be authorised. Ghost Rider: someone on a bike who has chosen a path of action for which the outcome may tangibly result in death. Here we see someone cutting across the lanes of the inner ring road/lewins mead while cars approach. The cars are moving pretty fast here. And he's across, alive. All hail the brave! When a sufficiently large number of vehicles park in a bus lane it effectively becomes unviable. What about half-parking, which these cars are doing. Well, you'd be continually trying to pull out into traffic, and as everyone who drives a car in Bristol knows, you never let a bus pull out, as it only slows you down. Remember, if this was wrong, the police would do something about it -if they saw it. VW do produce some low CO2 vehicles. Which they get lots of press for. A nice, friendly company that cares. But if you look at what they like to sell, its these toys. Which are entirely unsuited to Bristol, both in parking and general all round driving. Yet their sheer impracticability makes them a wonderful status symbol. If you can afford this, you have somewhere spacious to park it; you can afford lots of fuel. If it was affordable and sensible, it would not be a status symbol. Why do VW sell them it? Well, with a selling price of 3-4X a polo the margins are fantastic. Also, the official servicing charges are double for everything you'd ask the company to do. Here we see what must be a collection of VW dealers at the Hotel du Vin, showing how much a positive contribution the VW product family makes to the city. Note also that Porsche is planning to/has taken is share of Volkswagen AG above 50%, so they now own the company. That's the same Porsche who were fighting the plans for London to charge extra to group G vehicles entering the congestion zone -even those of residents. No doubt the Touareg fleet will also benefit if Boris scraps this change. It was very tempting to go into the hotel and notify them that I'd just reported their pavement parking to the council and they had 15 minutes to move their toys off the pavement, but I didnt have time to hang around and watch the consequences. Cotham Brow is closed for road works; they are slowly moving up the hill. Until completed, the road is closed to everything but buses. Therefore, this Saab P402 FRX is a bus. As is this Bristol Taxi and the AA van going the other way. Being down to one lane, Cotham Brow is very narrow now. Which is why it was closed to all but buses. But nobody is bothering to enforce it. Why not? Are the drivers trusted? Is enforcement of traffic regulations no longer something the council bothers to do? When the next bus came along, the cars gave up and turned back up Archfield road. Conclusion: buses make the best enforcers of bus-lane rules. Zebra Crossing parking spaces are not just for shoppers, they are used by delivery vehicles. Here we see a pair of city-link vans, one on the crossing, one double parked just past it. This is a bit inconvenient for cars, as it forces them into the oncoming lane and so the approaching bicycle. To address this, one of the vans moved to pavement park on the yellow lines on the opposite side of the road. Now it is oncoming bikes that have to give way to cars. 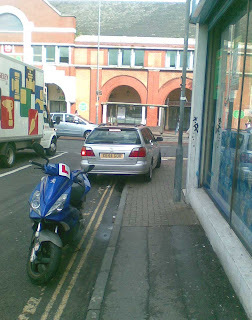 Here in Bristol the legitimate parking spaces are all used up by residents and commuters, and the not-so-good spaces -corners, pavements- by residents. What if you only have a short amount of time to stay, and want to park near the shops. Well, that's what zebra crossing are for. Based on the assumption that if you parked there all day you'd get a ticket, Bristolians only park there for short amounts of time. 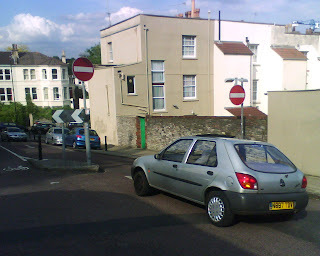 Here's a volvo occupying the crossing approach where Cotham Hill abuts Whiteladies Road. To show you are short staying its good to leave your hazards on, or, as in this case, leave someone in the passenger seat. Someone has been building a set of jumps and berms in Eastville Park. Given that there is a concrete wheel park only two miles away, it is clearly an act of mindless vandalism to make a corner of Eastville Park fun to ride in a BMX or Jump Bike. Not a classic XC MTB, as the jumps are big and aggressive, and only work if you plan to clear the problems. This is in the eastern edge of the park, near Everest Road, right about here. This is why, even though white-vans are the hard-men of urban parking, down in Picton Street even they get as far onto the pavement as they can. Here we see a very large truck trying to work out how to get through, while a gas-powered fork lift truck nimbly cuts through the gap. Part of the 20M pound cycling city funding is going in to new safety signs to warn of cyclists and pedestrians. Just in case they were not aware of that fact already. Having seen a real RTA outside our house at the weekend, I can point out some fundamental differences. The key one being that in fiction the police actually turn up. Its pretty easy to be dismissive of this learner driver, that is learning to park on the double yellow lines, but not the pavement. 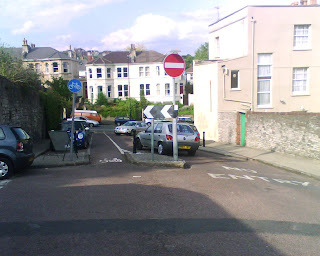 This is unfair, as it is the steep hill on Horfield Road, outside the BRI. So they are learning how to hill park on double yellows; trying to do pavement hill parking is something best put off until you've got your license. Just in case you accidentally do it during the test. Congratulations to Less's Driving School for teaching the truth! This was caught on the way to school this morning: a vehicle doing some emergency parking on the downs. Vehicle access to the downs is always a bit controversial; they ban bikes, let the zoo is allowed to take over a large area on summer weekends and charge a fee for parking on it. Here we see something that should be allowed to use the downs as a parking area, as the alternative -Redland- could be fairly destructive all round. This black BMW on stokes croft may appear to be a classic example of a selfish car driver, more concerned with a short walk to their destination than the safety and convenience of others. By blocking the bike lane it forces cyclists into the single lane highway alongside it. But in fact, this is a safety facility. Because look the other way. As the junction is approached, cars pull in to the bike lane before making a left turn. If you were cycling down there, you'd be at risk of having the left-turning vehicles squashing you. By making you merge into the single lane -and stopping that left turn lane beginning early, the BMW is creating a safe junction for everyone. Which goes to show -appearances can be deceptive. This van appears to be making it pretty tricky to negotiate the bike path between Springfield road and nine-tree hill (BTW, where are those trees?). To get through this gap you have to descend the hill, yank hard on the brakes and zig zag into the cutting. But actually this could be beneficial. It forces anyone with limited skills to slow down before hitting Nine Tree Hill, so making their approach safer. And as for those with the skills, with a rugged enough bike and good timing, well, what does it offer? An excuse. An excuse to come down Springfield road at speed, clear the pavement instead of the bike lane, and launch yourself straight into the nine-tree downhill at race speed! There's a bit in the driving test where you have to reverse round a corner. Here's a variation. Reversing round a corner to park on a pavement above double yellow lines. To make things more exciting, it's a busy weekday in Bedminster, and this car is trying to reverse park on the wrong side of the road from East Street into Philip Street: a tricky manoeuvre. Which they pull off, coming up right up against the L-plated scooter that is also parked on the yellow lines. Reversing up to anything that is below the line of sight of your car is usually pretty dangerous, but this car pulls it off. Impressive! Bristol Parking as done by a professional! When you buy a Volvo, especially a Volvo XC90, you are making a statement: that you care about the welfare of your passengers. But actually you are making another statement: that you care more about your passengers than you do about any other people on the streets. And when you take your dear little children to school in your Volvo, you don't want their life endangered by other vehicles. Which is why, once you buy a Volvo XC90, you are obliged to park in front of the pedestrian/bicycle access point to the school, on double yellow lines. Nothing else would be as safe as your new SUV. During the month of June if you buy an XC90 in our end-of-school-year sale, Volvo will pay for all parking fines accrued within 30 metres of a school. Volvo: because you know whose children matter the most. Pedestrians crossing busy roads often use Zebra crossings, as they are the only safe way to get across. However, for the car driver, Zebra crossings are bad news: the walkers have right of way. You can ignore the crossing rules : examples, the silver BMW on Saturday, the grey Bristol taxicab on fFiday. But that places you at a legal disadvantage. You could petition the council to take away the zebra crossing, but that would look bad on their pedestrian safety statistics. So what other options are there? One option is to replace the zebra crossing with some kind of pelican crossing, with the timings optimised for traffic flow and not pedestrian convenience. 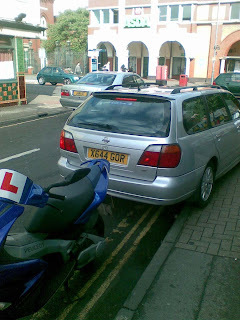 Examples of this are common in the Gloucester and Cheltenham Roads, but they are expensive. 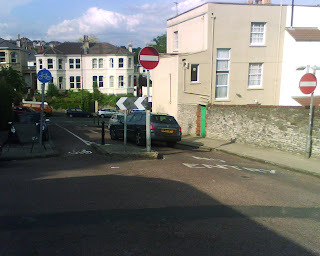 What is being prototyped here in Whiteladies Road is a new crossing, a half-zebra. In a half-zebra, the zebra crossing only goes half way across the road. the other haf is marked "Crossing Not in Use". Leaving the pedestrians to run across the road with no requirement for cars to give way to them. 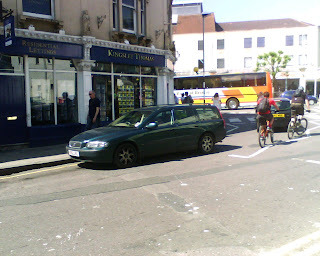 This is a classic example of why cycling on the pavement is inconsiderate, dangerous and should be punished. There is clearly not enough room for anyone walking to get through this narrow stretch of pavement between the wall and 4X4 pavement parked on the double yellow lines. The small child cycling along this pavement is clearly endangering others. Something must be done to stop this menace today! The growth in numbers of schoolkids being driven to school not only increases congestion, it means that the children grow up not knowing how to walk round a city. To correct this, some schools are providing lessons in how to walk. Here a class from Sefton Park school are being given a walking lesson up Hurlingham Road, St Andrews, practising walking along a pavement with cars parked on it. then crossing the road itself. As it is so unusual for children to be on a pavement, they are all equipped with high-visibility yellow tops. This may seem an admirable exercise, but note how the teachers are actually blocking cars from getting down the road while the children get across. This creates an unrealistic expectation for the kids: that cars will give way to them, and inconveniences car drivers, who get needlessly delayed. There must be a way to provide these lessons without inconveniencing cars. Maybe there is a Nintendo Wii "walking" game, or perhaps a special part of school -the playground- could be set up to resemble a Bristol street. That way the children could get their lesson in without making the commuters late.